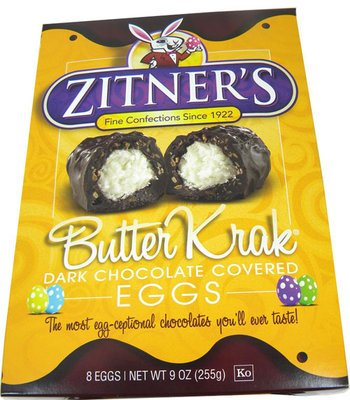 We at Blair Candy would consider several candies to be titans of the Easter candy market, and we’d be remiss to leave out Zitner’s butter cream eggs from that bunch. Zitner’s eggs are classics among Easter egg candy, so we’d like to spotlight a few of these while we’re deep into the Easter season. We’re starting with the company’s lovely butter krak dark chocolate-covered eggs. These are Easter eggs covered in scrumptious dark chocolate and filled with a creamy, buttery cocoanut mixture. They’re absolutely irresistible, and we’re guessing you won’t be able to eat just one. Zitner’s cocoanut cream eggs bring yummy coconut to the forefront. Also covered in dark chocolate, these eggs are filled with creamy coconut goodness for all you chocolate/coconut fans out there, and we know there are a lot of you! Last, we have Zitner’s milk chocolate-covered peanut butter eggs. Delicious chocolate encases creamy peanut butter inside the egg. Like a good Gardner’s or Reese’s peanut butter egg, these are basically impossible to refuse, and they make a welcome addition to any Easter candy basket. Just make sure you get enough to go around, because we’re thinking no one’s going to want to share these. You can get any of these Zitner’s chocolate eggs mentioned here right now from BlairCandy.com, and we suggest you do before they’re all sold out!